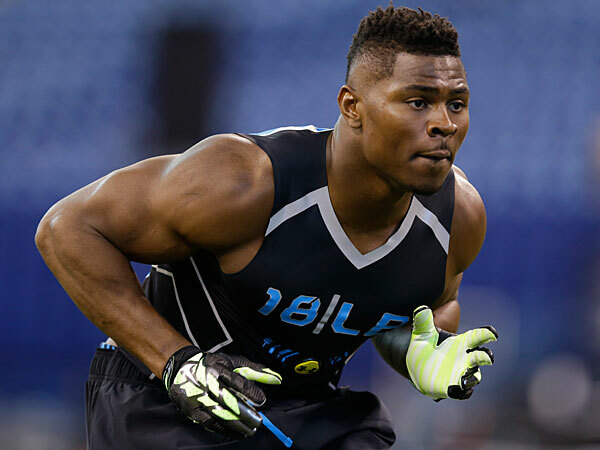 University of Buffalo linebacker Khalil Mack is a freakish athlete that may be the first linebacker taken. The 2014 NFL Combine is now in the books. We will give recaps of the players that made money by improving their draft stock. Today we continue with day three of the Combine when the defensive line and linebackers were on display. The last group to compete on day three were the linebackers. What NFL teams want in a linebacker varies by the scheme. 3-4 teams want outside linebackers that can rush the passer and inside linebackers that can run to the ball. 4-3 teams may require their linebackers to take on more blocks or cover tight ends. The Tampa 2 scheme wants middle linebackers with enough speed to drop deep down the middle in pass coverage and they like smaller weak side linebackers that can be disruptive. No matter what type of linebacker you want, you should be able to find them in this draft. Anthony Barr – UCLA – OLB – (6-5 255 lbs. ): Former fullback. A little bit raw with only two years of experience as a linebacker. Very fluid and athletic. Great flexibility and shoulder dip when rushing the passer. Despite his height, he plays with good pad level. A good fit for a 3-4 team that could turn him loose to rush the quarterback. Ran 4.66 40 yard dash and 6.82 3 cone drill (#3 LB). Lamin Barrow – LSU – OLB – (6-1 237 lbs. ): Versatile linebacker that played inside and outside for the Tigers. Better fit as an outside linebacker due to his size, speed and athleticism. Good agility. Bends his knees and plays with leverage. Ran a 4.64 40 yard dash (#3 LB) and broad jumped 10’3” (#4 LB). Khairi Fortt – Cal – OLB – (6-2 248 lbs. ): Fluid athlete with loose hips. Changes direction very well. Runs well and has good range. Very good athlete. Good fit as a weak side linebacker in a 4-3 defense. Had 30 bench press reps (tied for #1 LB). Boseko Lokombo – Oregon – OLB – (6-2 225 lbs. ): An athletic player that looked smooth and fluid in the drills. Only a two year starter that is raw and is still developing his instincts. Could take some time to develop into a starter, but has the pass coverage skills to contribute immediately in nickel packages. Broad jumped 10’2” (tied for #5 LB). Khalil Mack – Buffalo – OLB – (6-3 251 lbs. ): Freakishly athletic. Very good balance. Very good flexibility and shoulder lean on pass rushing drills. Could play the weak side in any scheme, but would thrive in a 3-4 scheme. Very good pass rushing skills and techniques. Disruptive player with a quick first step. Very good in pursuit. Although he played at a small school, he played better against top competition. Likely the first linebacker taken in the draft. Ran 4.65 40 yard dash (tied for #4 LB) and a 4.18 short shuttle (#5 LB). Vertical jumped 40” (#2 LB) and 10’8” broad jump (#2 LB). C.J. Mosley – Alabama – ILB (6-2 234 lbs. ): Versatile linebacker that could play inside or outside. Good lateral movement. Smooth and fluid in space. Good hip flexibility. Shows good power. Able to drop into coverage. The best fit is likely as an inside linebacker in a 3-4 scheme. Kevin Pierre-Louis – Boston College – OLB (6-0 232 lbs. ): Had a good day with some very good measureables. Good speed and quick twitch ability. Good lateral movement. Needs some work on his strength and instincts, but the athletic ability is apparent. Ran a 4.51 40 (fastest LB) and a 4.02 short shuttle (#2 LB). Had 28 bench press reps (tied for #3 LB). Vertical jumped 39” (tied for #3 LB) and broad jumped 10’8” (tied for #2 LB). Ryan Shazier – Ohio State – OLB (6-1 237 lbs. ): Versatile, athletic linebacker. Led the Big Ten with 144 tackles. Disruptive player that can shoot gaps to blitz and makes plays behind the line of scrimmage. Has the speed to chase down plays all over the field. Explosive lower body with a very quick first step. Ran a 6.91 3 cone drill. Vertical jumped 42” (Combine best) and broad jumped 10’10” (#1 LB). Prince Shembo – Notre Dame – OLB – (6-1 253 lbs. ): Played defensive end and linebacker for the Fighting Irish. Good lateral movement. Good strength. Highly competitive and has a good motor. Stays under control. Strong lower body. Likely a good fit as a 3-4 outside linebacker. Vertical jumped 38.5” (tied for #4 LB) and broad jumped 10’2” (tied for #5 LB). Telvin Smith – Florida State – OLB (6-3 218 lbs. ): Former safety with very good speed. Doesn’t have ideal size. Very smooth and fluid. Has quick twitch muscles. Flies to the ball and brings energy to the defense. Tackles well in space and makes plays behind the line of scrimmage. Should be able to play in nickel packages and special teams right away, but may need to add bulk to play full time. Could be a good fit as a weak side linebacker in a Tampa 2 defense (think Derrick Brooks role). Jordan Tripp – Montana – OLB – (6-3 234 lbs. ): Came to the Combine as a relative unknown, but looked really good in drills. Has good speed. Keeps his eyes up in traffic. Smooth change of direction. Great motor and intensity. Good special teamer. Ran a 6.89 3 cone drill (#4 LB) and 3.96 short shuttle (#1 LB). Kyle Van Noy – BYU – OLB – (6-3 243 lbs. ): One of my favorite players in the draft. Versatile player that can do it all on defense. Good pass rusher that can move around and rush from the inside or outside. Moves well in space. Able to drop back into coverage and knows how to get into passing lanes. Steps up as a playmaker when his team needs it most. Probably a better fit as a 3-4 rush linebacker, but could also play as a weak side linebacker in a 4-3 scheme. Avery Williamson – Kentucky – ILB (6-1 246 lbs. ): Looked very smooth in on-field drills. Good pass rushing technique. Team leader that was highly respected in the locker room. High football IQ. Able to make calls and get everyone lined up correctly. Likely a good fit as an inside linebacker in a 3-4 scheme. Ran a 4.07 short shuttle (#3 LB). Jordan Zumwalt – UCLA – ILB (6-4 235 lbs. ): Looked smooth in drills. Smooth transitions and change of direction. Good pass defender. High football IQ. Throws his body around and flies to the ball. Has played all the linebacker positions, but likely projects as a 3-4 inside linebacker or maybe a middle linebacker in a Tampa 2 scheme. This entry was posted on March 18, 2014 by draftmaniacs in All-Star Games and Combine and tagged 2014 nfl combine, 2014 NFL draft, Anthony Barr, C.J. Mosley, Jordan Zumwalt, Kevin Pierre-Louis, Khalil Mack, Kyle Van Noy, NFL, NFL Combine, NFL Draft, Prince Shembo, Ryan Shazier.